Affordable Accoutrements: Mix it up! Below is the mixer I found at a local estate sale over the weekend. I wasn't interested at the asking price of $85. I went back the next day, and it was reduced to $50. It looked rather forlorn and appeared to have suffered years of neglect. It was unsightly, if not downright unsanitary. I offered $40, and my bid was accepted. Naturally I had first asked permission to plug it in and make certain it operated as it should. The wire whip attachment was very difficult to attach (due to the layers of built-up grease and grime on the whip, the spring, and the spindle), but I managed. It seemed to work well at every speed, and there were no unexpected sounds (or burning smells!). Not perfect of course, but not bad for a decades-old kitchen appliance. It was made by Hobart, producer of KitchenAid mixers until the line was sold to Whirlpool Corporation in 1986. A bit of research tells me this particular mixer was produced in the 1970s. Before the 70s the power cords were gray or brown. After 1977, this model become the K5SS. I had uneasy moment when I arrived at the sale on the second day. There were two ladies looking at the mixer. One said "Oh look, it's a KitchenAid." The other (who appeared to be in her 70s) replied, "I know, but I don't need it. I'm still using Mother's old KitchenAid." I made it shine with a small amount of furniture polish applied with a soft cloth. It looks ready for action in the picture below, alongside its younger cousin, a KSM90 in the "almond cream" shade (from a different estate sale - a slight splurge at $60). I might as well admit something to you. My name is Bill, and I'm a KitchenAid collectaholic. I also have a white KitchenAid Classic (K45SS) -- $8 at a local thrift shop. It was almost as dirty as the latest acquisition and had numerous scrapes where the paint appeared to be missing. Fortunately, I was able to remove them with Soft Scrub. It now looks (and runs) great! Like many home appliances, the standing mixer has industrial antecedents. In the 1908, engineer Herbert Johnson was observing a baker mixing bread dough with a metal spoon; soon he was toying with a mechanical counterpart. By 1915, his 80-quart Hobart mixer was standard equipment on all U.S. Navy vessels, as well as in many commercial bakeries. World War I intervened before Hobart could jump into the residential market, but by 1918, company executives were testing models in their homes. "I don't care what you call it," legend has one of the executives' spouses espousing, "all I know is it's the best kitchen aid I've ever had." The name stuck. 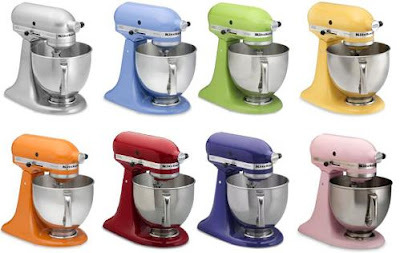 The first 5-quart countertop KitchenAid mixers were not cheap:$189.50, or about $2,000 in 2002 dollars. Weighing in at 65 pounds, they weren't convenient, either. But that all changed in 1936, when pioneering industrial designer Egmont Ahrens trimmed the mixer down and chopped the price to $55. The iconic Streamline shape has changed so little that Ahrens' bullet silhouette is patented. In the early years, retailers were slow to take on the KitchenAid mixer. To counter their reluctance, Hobart established a direct sales force made up primarily of women who went door to door offering demonstrations of the new food preparation tool. With the creation of citrus juicer and food grinder attachments in 1919, KitchenAid mixers were on the road to becoming the versatile "food preparation tools," as they were subsequently styled. Among the early users of KitchenAid stand mixers, were such famous names as John Barrymore, Marion Davies, E.I. DuPont, Henry Ford, Myrna Loy, Federick March, Ginger Rogers, and New York Governor Al Smith. Today's KitchenAid mixers can be converted to anything from a pasta maker to a sausage stuffer, an ice cream maker, or grain mill with the addition of optional attachments. KitchenAid mixers are now available with higher power ratings and larger bowls, aimed primarily at those who use them for double recipes, kneading wheat dough, and other heavy mixing tasks. This is a loaf of country white bread from Betty Crocker adapted to the Kitchenaid. 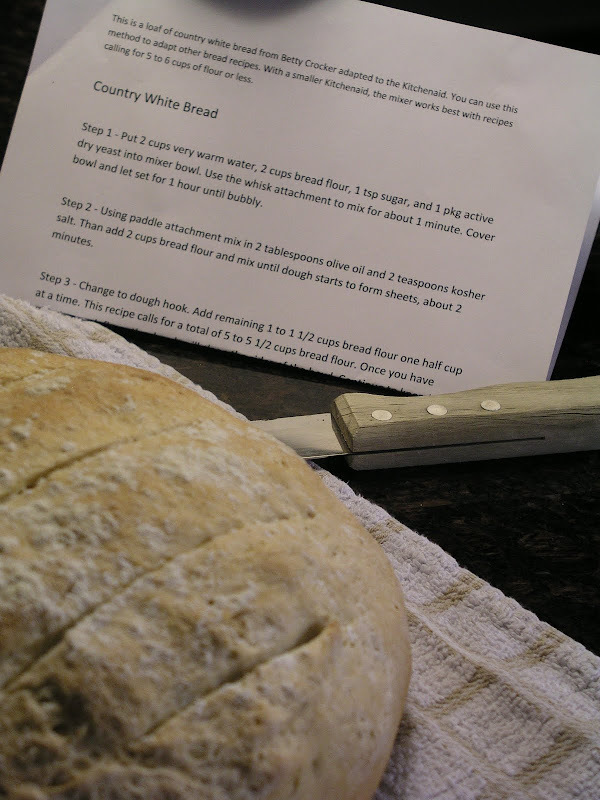 You can use this method to adapt other bread recipes. I have a smaller Kitchenaid, so I find my mixer works best with recipes calling for 5 to 6 cups of flour or less. Step 1 Put 2 cups very warm water, 2 cups bread flour, 1 tsp sugar and 1 pkg active dry yeast into mixer bowl. Use the whisk attachment to mix for about 1 minute. Cover bowl and let set for 1 hour until bubbly. Step 2 Using paddle attachment mix in 2 tablespoons olive oil and 2 teaspoons kosher salt. Than add 2 cups bread flour and mix until dough starts to form sheets, about 2 minutes. Step 4. Coat a bowl with olive oil, add dough, cover, and let rise for 45 minutes to 1 hour, until doubled. Step 5 Gently deflate dough and shape into a ball. Place on greased cookie sheet. Cover and let raise until doubled, about 45 minutes to 1 hour. Step 6. Heat oven to 425 degrees. Place cake pan with inch of water on bottom shelf of oven. Spritz loaf with water and slice 3 to 4 decorative gashes across top of loaf, about 1/8 inch deep. Sprinkle with flour for a rustic look. Bake 35 minutes. In terms of color, I still like the classic white or cream, but there are many, many ... many options these days! 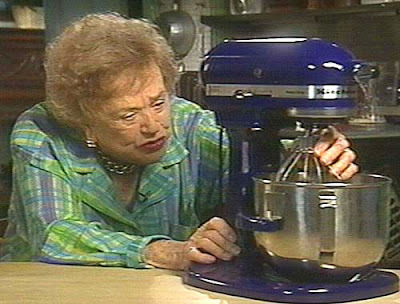 Julia Child loved her cobalt blue KitchenAid. The one that sits on the counter in her kitchen at the Smithsonian contains a special feature: the mixing bowl is engraved with “Bon Appétit Julia Child.” This stand mixer was a workhorse in her kitchen and appeared regularly on the television series Baking with Julia. 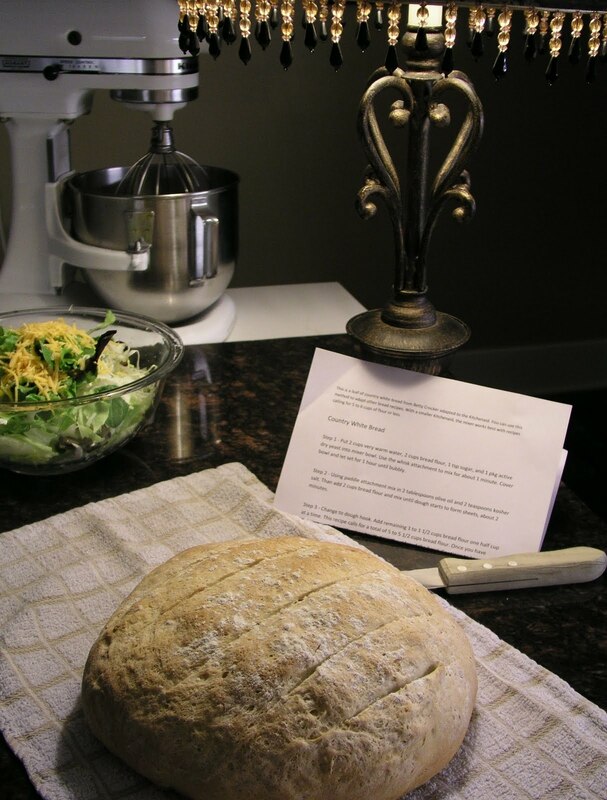 "Although you can prepare the dough by hand, a heavy-duty mixer with flat beater attachment makes light work of it . . ."
I'm not a full-fledged foodie by any means, but I'm joining the charming and talented Michael Lee of Designs by Gollum for Foodie Friday. Check out the culinary fun HERE! Is cleaning a neglected mixer a metamorphosis? I think it could be considered a minor one at least, so I'm also participating in Metamorphosis Monday with Susan of Between Naps on the Porch. Check out Susan's fun post and all her participants' great transformations HERE! It's amazing what a little elbow grease can do - you really turned it into a gem, especially for just $40! Really neat that you have so much info on the company, too, thanks for sharing your knowledge as well as great photos of this terrfici find! Congratualtions on such s fine find!! I too own more than one KA...mostly because of our catering business but it is fun to have more than one going at a time. Bill, You got a heck of a deal! Mine is classic white and I sure do like her. What a great find and price! I love my classic white KA Professional 6. Although I have told DH of 30 years that presents with an electric cord is grounds for divorce... I love him for it! So I got him the grinder attachment for his birthday one year. He makes his own breakfast sausage, and it is wonderful! Win-Win! I had no idea KA has been around for so long! Great post! Splendid job cleaning and negotiating. You can never go wrong with a KA. I started off with a white one (wedding gift) but while browsing through a kitchen app. store my eyes fell onto a bigger industrial KA mixer (black). The clouds split and heavens began singing. I managed to talk my hubby into purchasing it for me. I explained that it would be the last mixer he'd ever have to buy. He liked hearing that. That was my selling point but now after reading your post about the 70 year old woman...it was true! I can't believe what you were able to do with your great find. When I saw that first picture I honestly thought, "Who'd buy that?" Your finished product answers that question very well. What a great post! Bill - you certainly found a diamond in the rough and made it sparkle! I just purchased the Empire Red for my daughter-in-law to-be's bridal shower! I will have to pass along your bread recipe. I cannot believe the before and after photos! Amazing what "love" you put into it! I admit all I have is a hand mixer, but I am crazy for pink Pyrex from the 50s, and I imagine it's the same feeling. Wonderful and educational post Bill!! Like every pot needs a chicken, every kitchen needs a kitchen aide! I LOVE mine! I saved and saved (for some reason I felt guilty buying it at first) and bought it 15 years ago. It is still going strong. It is such a work horse. I love this delightful post! The elbow grease love you put into your new forlorn treasure really paid off! It is a shining example (literally)! And thank you for posting about Julia Child's mixer. I am reading her book, My Life in Paris right now and I am just in love with Julia. She is such an unlikely person to have such great success by the worlds standards, but she paid no attention to that and forged her own destiny! Don't you just love that attitude. What an acomplished woman! I always learn something new when I come to visit... and it is always pure joy! Wow, I can't believe how new you made that old machine look. I am a kitchen aide fan too. I have a purple one, a red one, a silver one and a white one. I have been tempted by pink and blue, but where would I put them. You certainly brought that Kitchenaid back to life Bill. I would have arm wrestled you for it too. My 26 year old son wants one so bad. I think I'm the only one my age who doesn't have one. I agree that white is the best, although at one time I wanted a red one. Great and informative post. Wonderful post, Bill! I'm still muddling along with my old Sunbeam Mixmaster but have almost done it in a few times with my mom's recipe for pumpkin bread. Since I usually bake that only during the holidays, it's been hard to justify investing in a Kitchen Aid. But, now I'm inspired to be on the lookout for a bargain like yours! I have seen these in Kitchens but never owned one. Looking at Amazon UK I can see why, they are quite a price and I do not do much baking etc.. so it wouldn't get much use.You have certainly cleaned it up well, if I saw it in that state I wouldn't of bought it, well done! I can see why you admitted to your addition as you know so much or researched into the item so well!! Have a great weekend, Jackie in Surrey, UK. Well you've shined that old gal up and made her quite new again. Hope you and your newest treasure will enjoy many hours in the kitchen together! Wow! You really cleaned that up well. I just put an old mixer down in my mothers basement for her that she is retiring. It is very heavy can't remember if its a Kitchenaid or not, might be Sunbeam though. She says it runs hot, so she's no longer using it. HMM??? Love all this info on the mixers too, I still cannot believe the turnaround on this. Bill, as always, this is one of my favorite places to visit. You always make me smile and feel good about dreaming. It's been a bad year for us and I'm trying a new business venture. I've been on the hunt for an older KitchenAide. Not to be found around here- you're a lucky man! They never die and they remain popular and sought after. I love my kitchen aid. Did not know that Julia's was blue! That's a new fact! Also, I believe any of the "investment" appliances should be white -- colors are too trendy! Bill, I LOVE what you did to make her sparkle and shine! 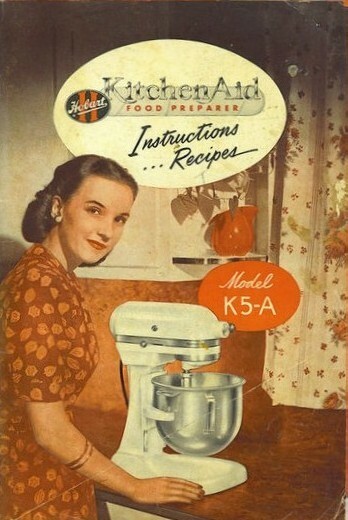 This is such a fun, yet informative piece on Kitchenaid. You always have such warm and fuzzy stories. My Kitchenaid is a "Caviar" Professional 5 Qt. 450W mixer with the bowl lift. I LOVE it! Thanks for a fun read. Great post. I have a red one and a white one! I worked at Williams-Sonoma for a few years. When we were furnishing out home in Florida I did red for the kitchen - Dualit toaster, blender and mixer. My white mixer must be over 30 years old - works like a charm. Good job cleaning it up. What a treasure! I have to keep my eye out for one..I've wanted one for years but the price has kept me from it...and those older colors are nice too! Mine is white. I've had it for ages and it still works just as well as the day it came home with me. Love it! We've moved many times and the white color always seems to go well with whatever kitchen we end up in. My only regret, or maybe it is just pure jealousy, is that my sister has one in pink. I do love pink. You always have the neatest posts. Thank you! I think when Hobart made them they were better. I was grossed out looking at that before you worked your magic on it! I wish you happy baking, whipping etc with it. I have a KA and a DeLonghi. Each has its pros and cons. But I think the KA will outlast the Delonghi by many years. It is already peeling where the bowl sits! Congrats on your purchase! Although my kitchen is so small and I can' even FIT a Kitchen Aid mixer, I DO have other Kitchen Aid things, utensils, bowls, little chopper, tea kettle, all in the Empire Red. Kitchen Aid stuff is sturdy and lasts a lifetime! Bill...what a before and after! Who the heck owned that mixer? It looked like something that would be found in a kitchen of the show "Hoarders". After your magic touch it looked like you just pulled it brand new out of the box! AMAZING!!!! What a unique posting! I bought my first KA last summer. It is white and looks like a jewel sitting on my kitchen counter. I love using it. I don't know why I waited 70 years to purchase one! Oh my, did I just let out some info on my age? I often eat at a little country drugstore with a soda fountain and they serve sandwiches and such and they have a display of many old and newer KA mixers in all colors on the top of the cabinets. It makes a beautiful display. Thanks for another info filled post. Bill that was one nasty KitchenAid mixer. My guy loves mixers and has several KitchenAid mixers and others. Not sure what all of them are. It's his thing! I do appreciate the beauty of them. He has a newer KitchenAid and I bought my daughter one for Christmas a couple of years ago...everyone should have one! I may have been deterred from buying that mixer with all the petrified bits on it...you did a great job of sanitizing...the ones made by Hobart are so much better than the newer ones. Great buy, too! My beloved Kitchen Aid mixer is cobalt. I could not even begin to estimate how many cookie doughs,cake batters,or gallons of whipped cream that baby has churned out. My daughter in law to be, registered for, and was blessed to receive one for her bridal shower. This modern bride chose metallic chrome. You did a fantastic job restoring the mixer back to it's original glory. This brings back memories of 'my' 1st Kitchen-Aid. About 17 years ago, I found a Harvest Gold Kitchen Aid in a locaL Junior League thrift store for $35. I was thrilled to get it and in great condition. It wasn't for me. It was for my 11 year old son at the time (now he is 28!). He was into baking and was harping on me to get one of the Kitchen Aid mixers. He used in a short video for a school project and I must admit he made the best Irish Soda Bread in that machine! Thanks for bringing that memory back to me! Alberto loves the one I got him for Christmas last year. And man, you can make a great post on any topic - even a mixer! Dear Bill, Mine is Pistachio green and it reminds me of a bygone era, the 1930's! Wow Bill this was such a great find and you really saw the diamond in the rough on this one! Not sure I would have gone back for this little baby but glad you did, its so beautiful now! Great job my friend, now its living and working in a loving home again after all those years of neglect. Mine is Metallic Chrome. I use it lots and have a bunch of attachments. Unfortunately they don't make things like they used to. This is so cool. I wish I could find a gem like that! I just love visiting your blog. Oh my goodness! You definitely had your work cut out for you on that one! My wonderful hubby bought me a refurbished kitchen aid (very similar to yours) and I love it! As much as I love the color pink, I'm glad he stayed safe with white! Cool Post Bill! I'm so glad you were able to save that little beauty! I have a pink kitchenaid mixer, the cancer pink one. My daughter bought it for me after I had surgery for thyroid cancer. I'm ashamed to admit I haven't even unpacked it from the box. But maybe this weekend I'll be inspired to do so and try your recipe! Gotta try that bread recipe! Thanks... and mine is white. Wow- I must not have vision, because that filthy mixer really scared me! I'm glad you were able to bring it back to a clean, disinfected state because I know it is made much better than they are now. The Hobart brands last for years and years. I don't own a stand mixer, but if I did- I would have picked red! Hi Dear Bill! Oh, you did so well on the mixer! Good for you saving this wonderful kitchen work horse. I have to admit, I don't own one! :( My daughter has one and she loves it and uses it constantly!! Speaking of Juila - when my daughter lived in Santa Barbara she was in Costco and saw Juila shopping. This was during Julia's last days and she was being pushed in a wheel chair. Now, since you're in the kitchen, I'm having a Heart of the Home party and we'll be showing our kitchens. I do hope you will come. I'd be so honored to have you participate!! You can learn all about it on my blog. Loved reading about, and seeing the photos of your new "Baby". What a wonderful buy! I found a cream colored K45SS Kitchenaid at a garage sale this past summer and I am in love! I couldn't afford one when I was doing all the baking for my family. Then later ouldn't justify spending that much, because there was nothing wrong with the mixer I had, and I was too busy to make much from scratch anymore. Somehow, being 60 years old was the magic age for me. It was a long overdue gift to "me" when I saw the man putting this Kitchenaid on the garage sale table with the $25 price tag. No haggle involved on this one! I hope everyone who reads your post will hang in there. Good things do come to those who wait. Bill, you are a veritable font of information! Thank you for this history of the Kitchen Aid. I have one. Now, you may find this odd, but I've never used it. LOL! My mother gave it to me. I think it was in the Eighties. It was after I married, but she bought me one. Why? I have no clue! You know, I avoid cooking like the plague, but I love gadgets, silver and china! Yes, accoutrements. Love them! Sendin you big hugs. I appreciate all the welll wishes for Mr. Magpie. He was a pretty sick boy, but he's better now. I am finished with my nursing duties only to shift gears and become Molly Maid. I have a mountain of things to accomplish, but it will get done. I hope to be blogging again soon. I have missed your wonderful posts SO much. Hey Bill! What a great thing you did...rescueing that old KitchenAid and cleaning it up so nicely! Good for you! I don't have a KA...never have. I don't bake enough to feel I could spend that much on a mixer. My mother always had a Kenmore mixer and it lasted for YEARS!! Thanks for sharing! Hi Bill, I don't have one, but now I will be on the lookout! Thank you for the detailed and informative post. I really enjoyed it. I have a K45 that I got as a wedding gift in 1973. It was outrageously expensive at the time and I used to worry that if it "died" I would never be able to afford a new one. Now I have bought them for each of my four children and I am pretty sure my Hobart built will outlast theirs...by years! I have never seen a used one, but if I do I think maybe I will buy it for back-up, you knwo, just in case! The bread looks so good. Thanks for the recipe and all the info. I enjoy your sense of humor, as always. What a grand old lady you have there. You did a fabulous job giving her a face lift. I have always used the mixer method for making mashed potatoes but I do mine a little differently than the chef. I don’t dry mine in the oven but I might try that next time. My Kitchen Aide was Empire Red. I passed it on to my new son-in-law for a wedding present since he loves to cook. I am now using my original stand mixer that I bought shortly have I got married. It's a different brand but it's the one I "learned on" and so I prefer it. Great Post BIll! A genuine find at an estate sale is fab (dirty or not). Thanks for showing us that a little bargain power plus a little elbow grease can go a long way. I loved your rescue story, and glad another grand mixer is being appreciated. Blue and Gold in a Flash!